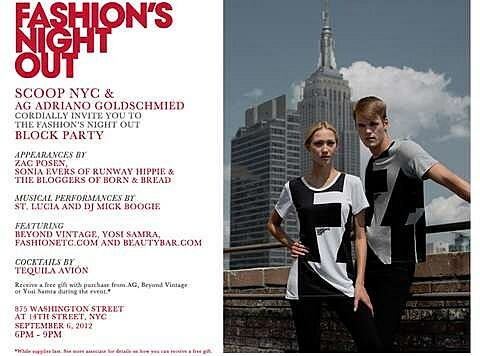 As mentioned, Thursday (9/5) is Fashion’s Night Out. Basically another excuse to throw a party (in the name of bringing money and attention to fashion), the evening has become music-oriented in the last few years with bands playing stores all over New York City. There’s a lot of stuff going on, including the Azealia Banks / DJ Cosmo performance at M.A.C. Soho we already told you about; plus Icona Pop and Maria Minerva at Urban Outfitters; Matchbox Twenty (!?!) at Bloomingdales; Haim at Topshop; La Sera at Helmut Lang; We Were Promised Jetpacks at Rockefeller Center; and Cyndi Lauper at Manolo Blahnik, just to name a few. Below is a list of all the shows we could find with basic details and links where applicable/helpful. All shows are free and open to the public unless otherwise noted. Many have free food and booze as well. For more into visit the Fashion’s Night Out website. Let us know what we missed, in the comments. 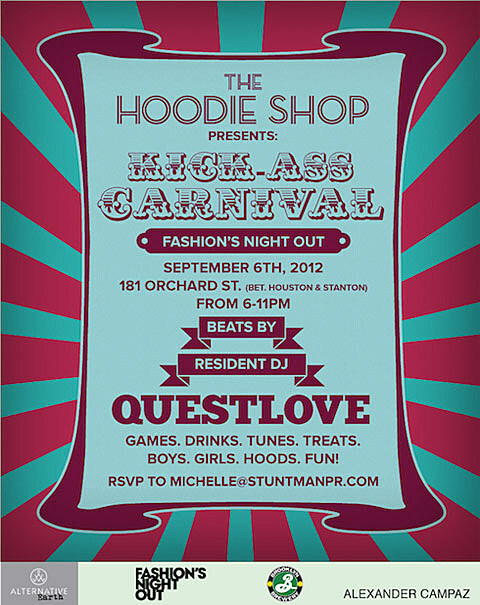 Questlove will be spinning tunes at The Hoodie Shop (181 Orchard) @ 6 – 11 PM.